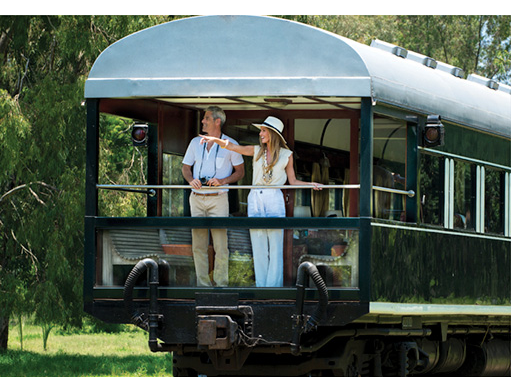 Rovos Rail offers an unparalleled experience by combining the luxury of colonial-era travel with modern innovations. 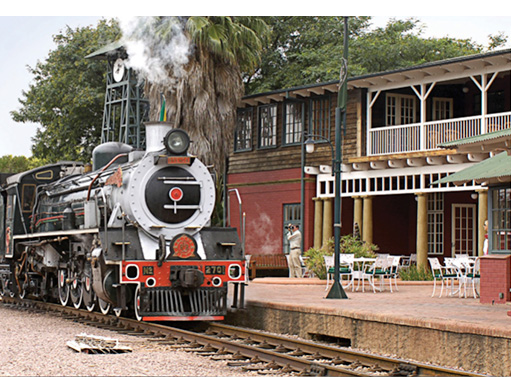 Its headquarters are located in Capital Park and its central station in Pretoria is undoubtedly the most impressive private train station in the world, with a spacious and elegant game room. The two classic trains called “Pride of Africa”, with a maximum capacity of 72 passengers in each, and the Edwardian train with capacity for 42 passengers, together with classic aircraft, carry out regular and annual scheduled trips. 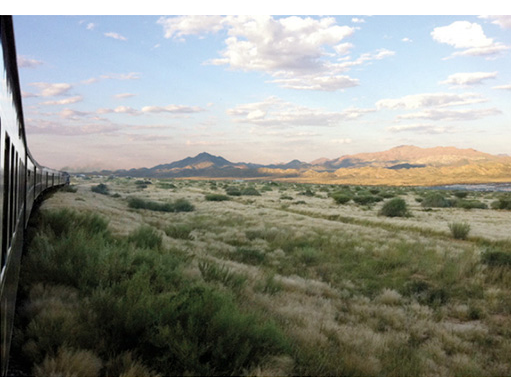 • A 48-hour, 1,600-km trip between Pretoria and Cape Town, with trips to get off the train to visit Kimberley and Matjiesfontein. • A 24-hour, 550-km trip along the spectacular garden route between Cape Town and George, including a trip to a vineyard. 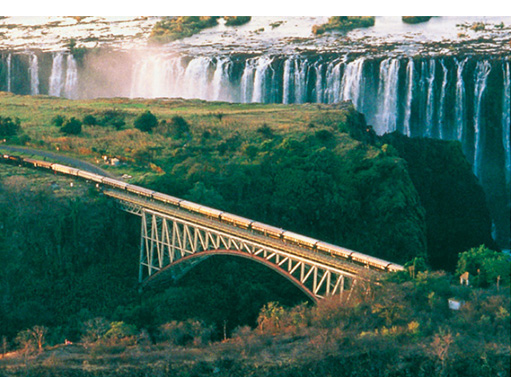 • A 55-hour trip from Pretoria to Victoria Falls, via Botswana to Zimbabwe. • A 55-hour Safari trip between Pretoria and Duroan including safaris in Nambili and in the Spionkop nature reserve. A visit to the famous Ardmore Potlery ceramics studio. • In addition, airplanes 440 of 1954 and DC 3 of 1944 are available for charters from the Lanseria airport in Johannesburg. • An epic journey to the heart of Africa takes place in July, every year, for 14 days traveling 6,100 km from Cape Town to Dar Es Salaam, Via Kimberly, Pretoria, Yel Madikwe National Park, Botswana, Bulawayo, Victoria Falls and Lusaka. Y through Tanzania to Dar Es Salaam. The route is one of the most famous in the world. • An annual 3,400 km trip to Swakopmund in Namibia in May, for 6 nights and 7 days, with an excursion to Kimberley, a visit to Fish River Canyon, a city tour and a safari near Windhoek, sleeping one of the nights in a Safari lodge in the Etosha National Park, with two safaris included. • African Collage is an annual tour that runs from Pretoria to Cape Town between May and June. This trip goes through Malelane, Hluhluwe, Durban, Bloemfontein, Port Elizabeth, Oudtshoorn, George to Cape Town with several excursions outside the train. 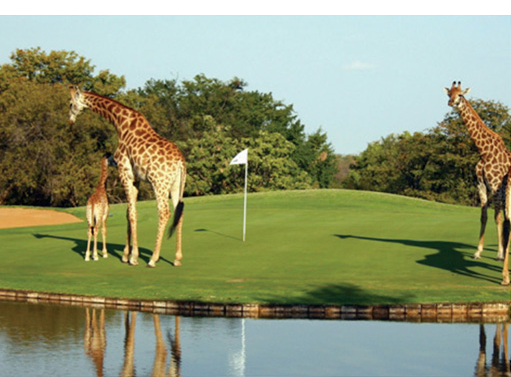 • The trip called Golf Safari takes place three times a year with a duration of 9 days during April, August and December, touring the finest golf courses in South Africa, combining golf with safaris in an environment like no other. • Another of the 17-day tours combines the train with the planes, visiting Cape Town and Pretoria, and then by air to Phinda Carne Lodge, Plettenberg Bay, Cape Town, Swakopmund, Okavango Delta, the Victoria Falls and back to Pretoria. 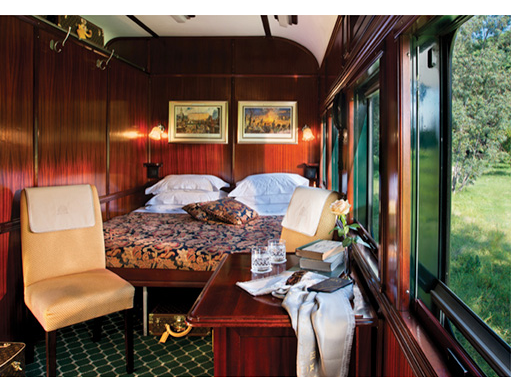 Rovos Rail offers luxury accommodation. 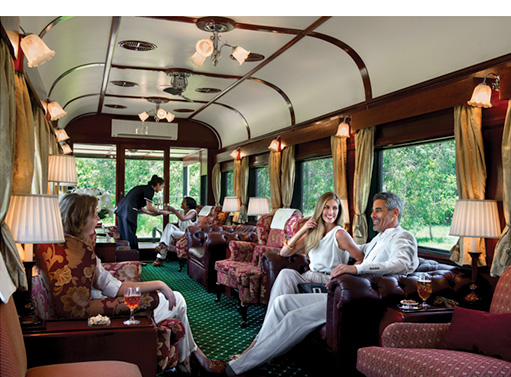 An unparalleled experience that combines the opulence of the trips of the Pre War with modern innovations. All suites have air conditioning and can accommodate two people, offering a double or twin beds option. The Royal Suites (16m2) each, have their private area with en suite bathroom, shower and Victorian bathtub. The Deluxe Suites (11m2) also have a private area and en suite bathroom with shower. The Pullman Suites (7m2) have a bed that during the day transforms into a sofa, which can also be twin or double and en suite bathroom with shower. Exceptional cuisine in an elegant atmosphere. 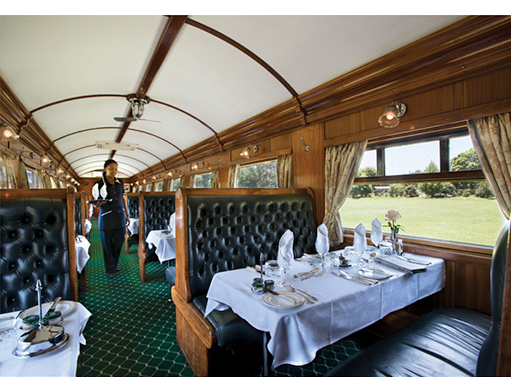 Breakfast, lunch and formal dinner are served in the magnificent Victorian car with capacity for all passengers at once. The gastronomy is carefully attended on board the trains and is accompanied by a selection of excellent South African wines. The dress during the night is formal. An observatory car is at the end of the train where you can enjoy excellent and unforgettable moments. Next to this is the smoking lounge. The non-smoking lounge is located in the center of the train. To maintain the spirit of the golden age of train travel, there is no radio or television and the use of cell phones is limited to suites.